Trailer for upcoming Korean film "Criminal City"
"Criminal City" is based on the infamous Heuksapa Incident of 2007, in which ethnic Korean members of a Chinese crime syndicate were arrested in western Seoul as a result of an increasingly violent turf war. Ma Dong-seok plays Detective Squad Chief Ma Suk-do, known for his brutal policing methods, heading a team appointed to bring down a Korean-Chinese criminal ring based in Garibong-dong led by Yoon’s Jang Chen. The presence of a rival local gang, of course, makes the attempts to bring peace to the neighborhood a lot more difficult than the police had anticipated. 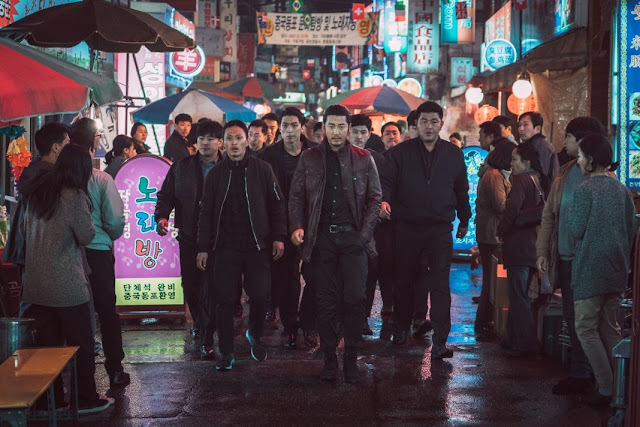 The film stars Ma Dong-seok (Train to Busan) and Yoon Kye-sang (The Bacchus Lady) in leading roles, with a strong supporting cast that includes Jo Jae-yoon (The Prison), Heo Sung-tae (The Age of Shadows) and Choi Gwi-hwa (A Taxi Driver). It's the debut of director Kang Yoon-Sung. Asian Film Vault: Trailer for upcoming Korean film "Criminal City"